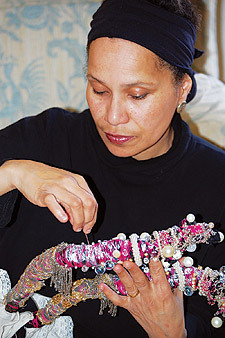 Terry works on another detail for one of her characters. 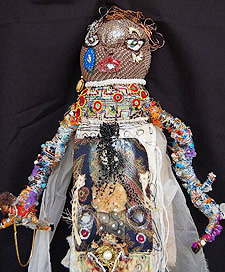 Closeup of a Jenoure "messenger"
From May 6 through June 28, Gallery in the Woods -- at 145 Main St., Brattleboro -- features a new mixed-media installation by interdisciplinary artist Terry Jenoure entitled "Abuela's Last Wedding." The opening reception is during Gallery Walk on May 6, from 5:30 to 8:30 pm. "Abuela's Last Wedding" presents a mystical tale about vows, commitment, and hope. In the narrative, Felicia is getting married, while her grandmother (her abuela in Spanish) is dying in the hospital. Nevertheless, Felicia finds a way to include Abuela in the ceremony and bring joy to her final hours. The tale is conveyed through layers of written text, figurative sculptures, objects, and an original multi-track recording of ambient sound and Jenoure's voice singing salsa rhythms. Combined, these elements convey the feeling of ceremony. About the installation, Jenoure says: "In my work, I celebrate pivotal personal moments that may speak to others -- those key moments when we are initiated into the circle: familial, political, phenomenological. I like referring to something larger than myself. I want to create parables. I want to tell stories. The figures in "Abuela's Last Wedding" are called Messengers. They are ancestral archetypes -- complicated, strong-minded big-mouthed creatures that come to us from a world that is fierce, bejeweled, effervescent! In their faces, torsos, and limbs, I explore more than the ordinary body. Some have talons for fingers and toes, or sport highly tattooed bodies. Others wear costumes that are glittery, glossy, textured adventures. Divine and magical, the Messengers blend the worlds of fable and memoir, and suggest the influence of headdresses, adorned masks, marionettes, and initiates into a secret society where super-figures wield power." A visual artist, musician, writer, and educator, Terry Jenoure finds full expression in her new installation. Born and raised in the Bronx, New York, she has exhibited in the U.S., West Africa, and Europe, and as a violinist and vocalist has performed and taught in various capacities worldwide. She earned her Master's and Doctoral degrees from the University of Massachusetts-Amherst, where she is also the Director of Augusta Savage Gallery. Terry is on the graduate faculty at Lesley University, has received grants from the National Endowment for the Arts and the New England Foundation for the Arts, and has been a consultant for the Lila Wallace Reader's Digest Fund, the Ford Foundation, and the Connecticut Commission for Arts and Tourism.